I don’t know too much about business-to-consumer products sales and marketing, except as a lifelong consumer of them myself. I’ve also never smoked. I took a look at a cigarette box the other day, as I hadn’t seen one up close for a while. It’s an odd existence marketing and selling cigarettes isn’t it? Even if you smoke them yourself. Working for a cigarette manufacturer must feel like being a social pariah. The packaging on fast-moving consumer goods is one of the traditional 4 P’s of marketing, along with product, price and promotion. 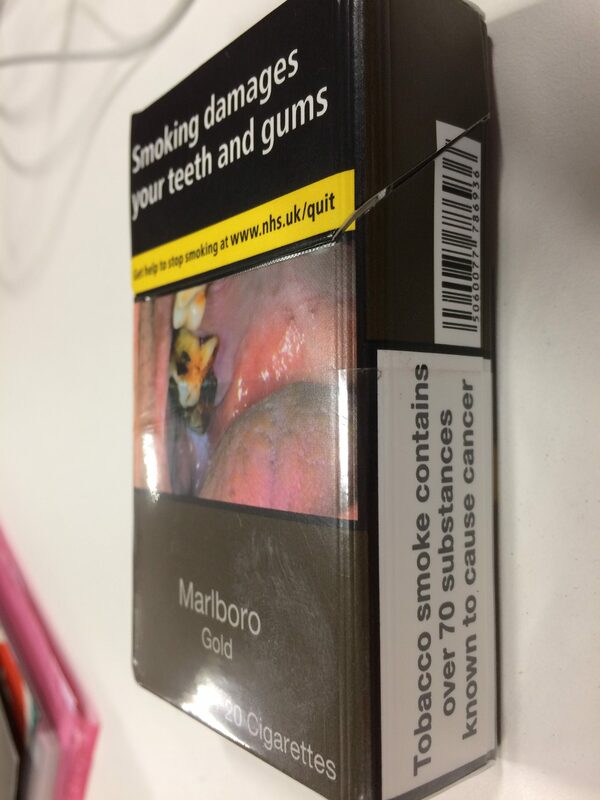 Yet when you look at cigarette packaging, everything on there is advising you not to buy it. The cigarettes are also behind the shop counter hidden in a cupboard where you can’t even peruse the packaging. You can’t advertise them through most media, thanks to the regulations of elected government officials, a good proportion of whom must be smokers too. If you work for a cigarette manufacturer you can’t get life insurance benefits or an occupational pension, so the manufacturer has to provide its own. It’s flippin’ expensive too, at least if you pay your country’s duty on them. Against all of this, people still buy a lot of cigarettes. Why is that? For one thing, cigarette smoking is still portrayed as being cool in TV and film, almost something to be aspired to. Front and centre, of course, is the obvious physiological pull of the nicotine, as well as the behavioural comfort that comes with smoking too. Without those addictive and behavioural factors, I wonder how successfully other things would sell if this amount of sales and marketing restraints were placed on it. A B2B customer is far, far more important than a B2C customer. Let me tell you why. I work from the home office quite a lot of the time. When I’m on a customer call, or a customer’s customer call, and there’s anyone in the house, I always warn them that I’m not to be disturbed unless the house is burning down. A B2C customer is one customer, one consumer out of many. There are degrees here, of course, since some B2C customers are large or repeat customers, and spend much more money than one-off or small basket-size customers. A B2B customer, however, doesn’t represent their own interests, they represent the interests of lots of other employees, who are in effect lots of other customers. They’re corporate and they have very, very deep pockets. And for that reason, they’re very important. If they take away their business from you, you lose an awful lot. If one consumer does, it’s no biggie. A B2B customer call is like the red ‘On Air’ sign outside a broadcasting studio. You’re broadcasting to a large number of individuals and are not to be disturbed. One bad experience is immediately magnified throughout the entire audience – or company.